Sushi is one of Japan’s most beloved exports and continues to grow in popularity worldwide with each year that goes by. Interestingly, it has its origins in Southeast Asia and not in Japan as one would naturally assume, so the Japanese may not have invented it but they certainly did perfect it. In this guide to Japanese sushi we’ll be looking at the different varieties, how its made, the equipment needed and the most commonly used ingredients. 3.1: What does sushi mean? 3.2: What kind of tuna is used for sushi? 3.3: What kind of rice is used for sushi? 3.4: What type of eel is used for sushi? 3.5: What does sushi taste like? 3.6: What is the difference between sushi and sashimi? 3.8: What is sushi wrapped in? What follows is only a small collection of what is available and is by no means an exhaustive list. There are many more varieties, but we have only listed some of the most popular ones. Toro is one of the most expensive sushi types available – and it can be hard to find. It’s the most prized cut from bluefin tuna and is the small fatty section from the stomach area. In Japan, toro is usually only served on special occasions and its said that the meat is so soft and tender that it actually melts in your mouth. Toro can be further subdivided into two sections – chutoro and otoro. Chutoro: The chutoro section of bluefin tuna is usually more preferred to the otoro part because it contains slightly less fat. Chutoro comes from the belly area of the fish which sits in between the otoro and akami regions. Otoro: The otoro section of bluefin tuna sits right beneath the stomach area and is by far the fattiest part of the fish. It contains so much fat that it actually almost breaks apart by itself. The word temaki in the Japanese language means ‘hand rolled’ and is named that for its cone shape which looks identical to a taco. It’s made from rice, nori and any choice of fillings which are commonly referred to as neta. Temaki is much easier to make than regular sushi rolls because of its cone shape and no chopsticks are required when eating since eating with your hands is the preferred way. Amaebi is sweet shrimp. These shrimps are cold water northern shrimp mostly taken from the Pacific ocean along the North American continent. They are very small in size which is why its not uncommon to get a double shrimp serving with your order. They are also the only type of shrimp you can eat raw because cooking them will remove most of the sweetness. For those who do not know, uni is the Japanese word for sea urchin, and when it comes to uni sushi its the genital area that gets eaten. It’s an acquired taste and therefore some people love it while others hate it. Many describe the taste as being sweet and not too strong. The bright yellow colored treat was once only served and consumed in Japan in the form of uni sushi and sashimi but it has recently gained worldwide popularity and can now be found in sandwiches and as pasta toppings in trendy restaurants around the world. The hamachi fish is known as the yellow tail, however it doesn’t refer to a single type of fish. Instead, the word hamachi (yellow tail) refers to three similar but different fish – yellow tail, amber jack and yellow tail amber jack. So when ordering hamachi sushi you could end up with one of the three mentioned species. All three are considered to be high grade fish but some are not fond of it because of the tangy taste and oily texture. Ika is squid and is regarded as being one of the most exotic types of sushi you can get. Some do not like the texture which is often described as being too firm. It’s imperative that the squid gets properly prepared since its easy to get food poisoning from it. The firmness of the flesh is attributable to the fact that its mostly muscle and therefore requires a bit more chewing. The rich, sweet taste makes it all worth it though. Suzuki sushi is made from sea bass. The name has been derived from susugi which means ‘washed’ because it looks very clean. Suzuki flesh is considered to be tough and to counter this sushi chefs will dip the freshly cut flesh into a combination of sake and warm water. Then immediately remove it and dip it into a bowl of icy cold water. By doing this, most of the fat falls away and the flavors of the fish gets enhanced. The word unagi means freshwater eel and is a common ingredient in many types of Japanese Dishes. When it comes to sushi, most things are consumed raw but with unagi its always grilled for health reasons. Unagi might not be on menu’s for much longer because eel populations have been drastically reduced around the world – and with it major price increases. Masago are the fish eggs (roe) of the Capelin fish species which can be found in the Arctic and Atlantic oceans. It’s more readily available and a cheaper option than the roe of it’s tropical cousin, tobiko. Masago is often dyed to enhance its color and tastes relatively bland when compared to tobiko. It’s still rich in omega-3 fatty acids which makes it a super healthy sushi. Tobiko sushi is very similar to the masago variety. The bright orange colored and highly nutritious fish eggs comes from tropical flying fish. They cost considerably more than masago and are mainly used as garnish or seasoning. Making sushi the proper Japanese way is an art which can take years to master but that shouldn’t deter anyone from making their own. Giving actual lessons is beyond the scope of this article but we will show an educational video and provide a list of needed equipment. Also, take a look at these basic sushi making classes in Tokyo and Kyoto. This video is owned and created by FortuneCooking. What follows is a list of utensils and tools one will need to make sushi. Not all items are essential but many of them will make your life easier. Making sushi rice on the stove is perfectly fine but a good quality rice cooker will save you a lot of time and extra work. Simply clean the rice, add it to the cooker with some water and the rice cooker will do the rest. Get an affordable rice cooker from amazon.com. A rice bowl, or a hangiri as the Japanese call it, is a non-essential item. It does however, serve a valuable purpose – the wooden bowl absorps the moisture from the rice; something a conventional steel bowl cannot do. Get an affordable hangiri from amazon.com. A makisu, or rolling mat is an essential item as it allows the chef to create perfectly rounded sushi rolls. Most makisu’s are made from bamboo. Get an affordable makisu from amazon.com. A good quality knife is essential as you need to cut raw fish effortlessly and perfectly. A quality knife of Japanese standards will also remain razor sharp for much longer than a standard one. Get an affordable sashimi knife from amazon.com. Nori sheets are a specially prepared type of seaweed which are cut into sheets and used to hold rolled sushi together. These sheets are rich in nutrients and are an essential item. Get affordable nori sheets from amazon.com. You went through all that effort to create sushi so why not serve it the traditional Japanese way? Get affordable sushi plates from amazon.com. Most people are under the impression that the word ‘sushi’ refers to raw fish but this is an incorrect belief. Raw fish, in actuality has very little to do with sushi since most varieties contain no fish whatsoever. The word means ‘vinegared rice’ and refers to the rice instead of raw fish. What kind of tuna is used for sushi? Sushi made from bluefin tuna is one of the most expensive varieties available. These fish are commonly found in the Pacific and Atlantic Oceans, are really big and can weigh as much as 1500 pounds. The pricing is set high because of their rarity which is a result from over fishing. Southern bluefin tuna, which is a viable alternative to the regular bluefin species, is often used in its place. They are somewhat smaller in size but the meat is of similar quality. These fish are mostly found in the Indian Ocean and are also considered rare due to over fishing. Typically, there are three cuts from bluefin used in sushi. The first comes from the back of the fish and is known as akami. It’s a delicious deep red colored meat known for its softness. The second cut is called otoro and comes from the upper section of the stomach area. It’s pink in color and is so soft because of all the fat that it literally melts in your mouth. The last cut, chutoro, comes from the lower belly. It has a very light pink color, contains a lot of fat and is almost as soft as otoro. Yellowfin tuna is not as rare as the bluefin species, therefore the price is considerably lower. The fish is also much smaller in size and weighs 300 pounds on average. They are commonly found in most tropical waters near or along the equator. Yellowfin meat can appear pink to red in color but is not as soft as bluefin, yet its delicious enough to make great sushi. If you ever order sushi in Japan without specifying the type you want – or if its simply labeled as tuna, you will most likely get served with yellowfin. This strange sounding fish shares a lot of similarities with yellowfin when it comes to texture and taste. It’s also slightly larger in size than yellowfin and got its name because it has bigger eyes than other types of tuna. These fish appear in the same waters as yellowfin – the warm tropical waters near and along the equator. Albacore tuna is what we in the West know as canned tuna. These fish are the least scarce of all tuna species and are therefore the most affordable. Sushi made from albacore tuna is also most commonly found in Japanese restaurants featuring conveyor belts. Albacore can be recognized by its light pink color and the texture is rougher than the higher grade species. The taste is also a lot milder than bluefin which is why sushi chefs have devised a different preparation method known as tataki to compensate for that. With the tataki method chefs lightly and quickly grill the surface of albacore and then dip it in cold water. The outcome is slightly firmer flesh with a less mild taste. If you ever come across something called bintoro sushi, then know its albacore tuna prepared the tataki way. What kind of rice is used for sushi? The type of rice used in making sushi is important. Polished white short grain rice is the ideal choice and its often simply referred to as sushi rice. There are different varieties, for example, in Japan short grain Japanese rice is a favorite; also known as Japonica rice. Medium grain California rice can serve as a good substitute and is often labeled as Calrose rice. What type of eel is used for sushi? Eel, or unagi as they call it in Japan is a much loved ingredient in various Japanese dishes. There are basically two types of eel – freshwater and saltwater eel – both popular in Japan but when it comes to sushi only freshwater eel is used. 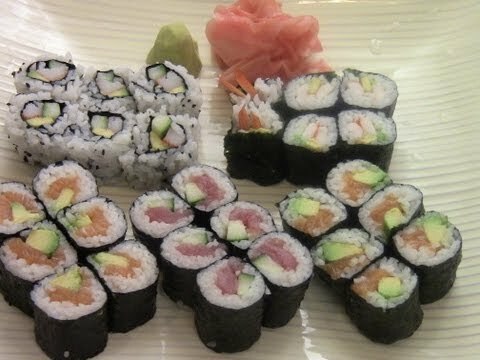 There is no simple answer for this question because there are many different types of sushi with each variety making use of unrelated and sometimes even related ingredients. The trick to this unique Japanese cuisine is to prevent the taste of one ingredient from overpowering the other; in other words – one should be able to taste everything in equal balance. Sashimi shares some similarities with certain types of sushi and because of that the two terms are often used interchangeably. Sushi is vinegared rice combined with any variety of other food items while sashimi is thinly sliced raw fish commonly served on top of a small pile of rice. There is no definitive answer because there are so many different types of ingredients one can use. The list of possible ingredients are far too long to cover but it really comes down to the choice of ingredients. What is sushi wrapped in? Sushi is normally wrapped in a special type of dried seaweed known as nori which can be recognized by its black / green color. Soybean paper, or mamenori as its known as in Japan, can also be used as a substitute. It’s common to have sauces with sushi today, although it’s a fairly new thing and hasn’t always been around. Here we will cover some of the more popular and commonly used ones. Finding a mayo based sauce on your sushi is common although it’s not from Japan itself. Instead, variations of mayo sauce and its use with sushi originated in North America. Some of the more popular examples include miso mayo, spicy mayo and garlic mayo. Ponzu is a citrus based sauce made from bonito tuna flakes, seaweed, mirin, yuzu (if not available, lemon will do) and rice vinegar; add some soy sauce to the mix and you have ponzu shoyu. It’s not only great as a sushi dip but is frequently used in many varieties of Japanese food. Unagi is freshwater eel and the thick, sweet unagi sauce was created for the purpose of going with Japanese eel based dishes. The ingredients used for making unagi sauce includes mirin, soy sauce and sugar. It’s often applied to eel while being grilled or small amounts are placed on top of unagi sushi. Shoyu sauce is the Japanese version of Chinese soy sauce and serves as a sushi dip. There is not much difference between the Chinese and Japanese versions but some variations of shoyu sauce contains up to 50% wheat. It’s also sweeter and less healthy than regular soy sauce. The choice of ingredients used depends on the type of sushi being prepared and there is a rather extensive number of options to choose from. This is by no means an exhaustive list; instead we have only listed the most widely and commonly used items. Mention the word sushi and most people would undoubtedly conjure up images of raw fish. Rightfully so, but which fish species are commonly used and compatible with this delicious Japanese cuisine? Tuna is by far the most popular choice and some species are associated with high end sushi. There are five species used: albacore, yellowfin, bluefin, southern bluefin and big-eye. To read and learn more about the various types of tuna visit the what kind of tuna is used for sushi? section. Apart from tuna, there are other types of fish also used. These include sweetfish, red snapper, salmon, sea bream, kingfish, trout, swordfish, mackeral, Japanese yellowtail, blue marlin and even blowfish. Ginger, with its plethora of health benefits is a vital ingredient in the world of sushi. Some know it as pickled ginger, others simply as sushi ginger or shin-shoga no amazu-zuki and gari if you are Japanese. The thinly sliced, pink colored young ginger which accompanies your sushi has been marinated in sugar and vinegar. Its purpose is to cleanse your palate so that you can better taste the different varieties of fish. Many people don’t know this but there are rules when it comes to eating ginger. Some will pile it onto their sushi and eat it like that while others put it into their soy sauce and then dip their sushi into the combination. Both ways are wrong. The correct way is to directly take a bite from the ginger in between trying the different varieties. Miso is highly popular in Japan and many types of cuisine makes use of this delicious seasoning. There are many varieties of miso as it can be made from a number of ingredients. It’s a thick paste with its base ingredients being fermented soybeans, salt and koji. Miso seasoning has been an important food source in Japan for centuries but has only recently gained interest worldwide. Wasabi, also known as Japanese horse radish, always goes hand in hand with sushi. You may know it as that green pasty stuff that burns all of your senses. Some people will request their sushi without wasabi while others cannot enjoy theirs without it. As with all things in Japanese cuisine, there are rules to follow when eating this condiment. It’s common practice for Westerners to mix their wasabi with their soy sauce and then dip their sushi into it. This, needless to say, is the wrong approach. The correct way is to take a tiny amount with your chopsticks and place it directly onto the sushi before consuming. Just like with brewing sake, not any type of rice will do. When it comes to sushi only a particular type of rice makes the grade – sushi rice. It’s a high quality short white grain rice known as Japonica. Calrose rice, which is more commonly found in the West, serves as a good substitute. Read more about this rice at our what kind of rice is used for sushi? section. Everyone loves avocado which is why its such a popular sushi ingredient. It’s one of the key ingredients in the world famous California roll and there are other varieties which makes much more extensive use of it. Freshwater eel, or unagi as the Japanese call it used to be a favorite option in sushi bars all across Japan prior to 2013. The reason being that these eels have undergone an 80 to 90% population reduction due to overeating. As a result, Japanese authorities have added freshwater eels to their list of endangered species. They are still consumed but the prices have risen dramatically and they are not as easily available anymore. Read more about eels at our what type of eel is used for sushi? section. Tofu, by itself is a very important food in not only Japan, but in all of East Asia. And not many people know this, but tofu is often used in sushi – especially with the vegetarian varieties. It’s a type of soybean curd that is very low in fat and high in protein. Tempura is a batter used for coating deep fried seafood and vegetables. The name tempura may sound Japanese but its actually Portuguese. It was introduced to Japan centuries ago when the Portuguese started trading with Japan. When it comes to sushi you can make rolls out of deep fried seafood and vegetables or alternatively make flakes and use them for seasoning. Imitation crab meat, or surimi as they call it in Japan, is processed seafood made from grinded white fish and starch. These ‘fish sticks’ are shaped in such a way that they resemble the actual legs of Japanese spider crabs. Although its imitation meat, its still popular in most Japanese sushi bars and is a featured ingredient in the famous California rolls. Edible seaweed goes by the name of nori in Japan and is considered a vital element in sushi rolls and onigiri. It’s used as a wrap to hold all the ingredients together and comes with an incredible amount of health benefits. Although, nori does appear green as seaweed should, it’s actually red in color and is a type of algae belonging to the Pyropia family. The Japanese have been using this seaweed for many other types of Japanese dishes since ancient times. Read more about nori in our what is sushi wrapped in? section. The super healthy flying fish roe, or tobiko as the Japanese call it, can be identified as tiny orange colored balls on your sushi. The main reason for its use is not for its health benefits or taste as one might think, but instead its used for visual appeal. They may not always appear orange (its natural color) and can appear in a multitude of colors thanks to organic dying. For example, tobiko can appear black from squid ink, red from chili, green from wasabi and even yellow from a citrus fruit known as yuzu. This edible dried kelp is called dashi kombu and mostly originates from Japan’s northernmost island – Hokkaido. Although considered to be very nutritious, when it comes to sushi it merely serves as decorations since its sprinkled on top. Dashi kombu serves as much more than seasoning with other Japanese dishes, an example being Dashi – a delicious soup with this specific dried kelp as its main ingredient. Dried shiitake mushrooms are a popular ingredient when it comes to vegetarian sushi rolls. They are also the third most cultivated mushroom in the world and have an enormous amount of health benefits thanks to its antiviral, antifungal and antibacterial properties. When used in sushi, they are usually purchased dry but has to be hydrated under cold water and then marinated for a very short while in mirin, sugar and soy sauce. Quail eggs, along with fish roe, are commonly used in tobiko sushi. These eggs are a quarter of the size of normal chicken eggs and with most other ingredients – consumed raw. It works by wrapping a small rice ball in nori and then placing the raw quail egg contents on top. Although delicious, there are health risks associated with this ingredient. High levels of cholesterol and saturated fats being the main problem and of course, the risk of salmonellosis (salmonella poisoning). Vegetables make a great alternative especially for vegans. There are varieties featuring just about every vegetable on earth – many which you know and some which you don’t. Asparagus, carrots, cucumbers and yams are just some of the options available. Thin cuts of raw meat is a Japanese delicacy know as sashimi and..
Want to make your own sushi? learn from these places in Tokyo City.. Some love it, some hate it. But how many actually know what it is? Learn how to make your own miso mayo by following the recipe here. Making unagi sauce is pretty easy and straightforward. Why not make your own? Ponzu sauce makes an excellent sushi dip. Learn how to make your own.